The direct premiums written in the Online Insurance Distribution amount to US$41,858m in 2019. The direct premiums written are expected to show an annual growth rate (CAGR 2019-2022) of 6.3% resulting in a market volume of US$50,274m by 2022. The market's largest segment is Property & Casualty with a market volume of US$24,601m in 2019. In the Life & Health segment segment, the number of policies sold online is expected to amount to 13.8m by 2022. 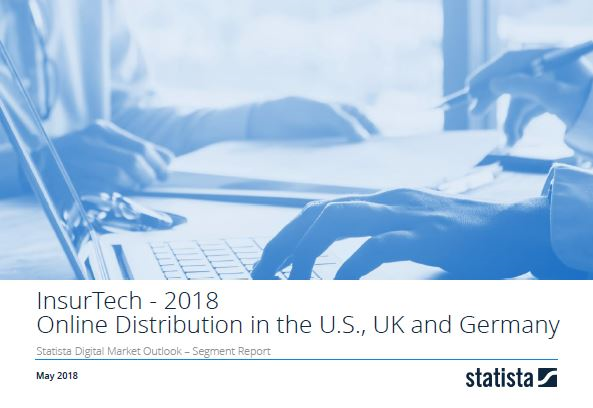 Reading Support Direct Premiums Written in the Special InsurTech: Online Distribution segment amounts to US$41,858m in 2019. Reading Support The Life & Health segment is expected to show a direct premiums growth of 6.8% in 2020. Reading Support In the Life & Health segment, the number of policies sold online is expected to amount to 13.8m by 2022. Reading Support The average premium paid per policy in the Life & Health segment amounts to US$1,262 in 2019.